"In his prayers to the spiritual master, Srila Visvanatha Cakravarti Thakura confirms that all the revealed scriptures accept the spiritual master to be identical with the Personality of Godhead because he is a very dear and confidential servant of the Lord. Gaudiya Vaishnavas therefore worship Srila Gurudeva (the spiritual master) in the light of his being the servitor of the Personality of Godhead. 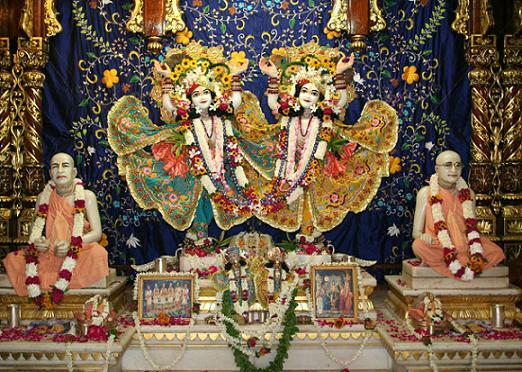 In all the ancient literatures of devotional service and in the more recent songs of Srila Narottama dasa Thakura, Srila Bhaktivinoda Thakura and other unalloyed Vaishnavas, the spiritual master is always considered either one of the confidential associates of Srimati Radharani or a manifested representation of Srila Nityananda Prabhu."